It’s been clear for some time now that Michonne has become something of a mother to Carl, ever since he broke into that restaurant in their hometown to retrieve the family picture on the wall. It’s been plainly obvious for a long time that she’s had a special connection with the Grimes family. 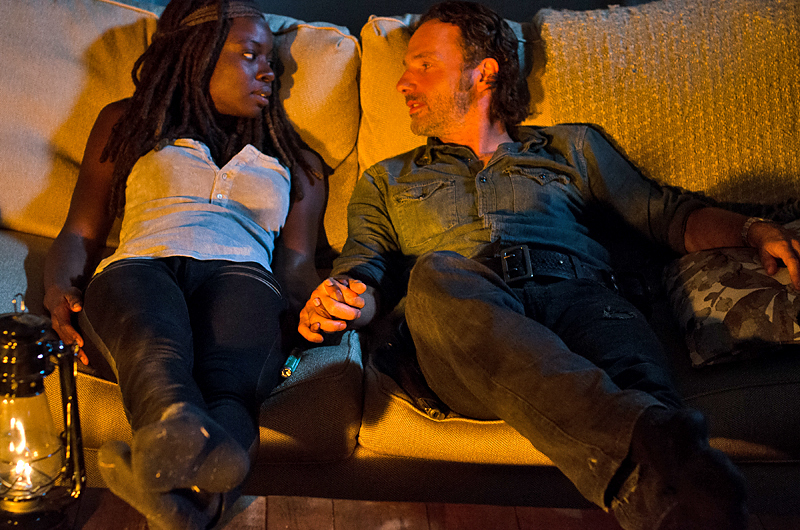 Rick and Michonne plop down on the couch at the end of the day, watching Judith on a baby monitor, and the tone of the conversation is every bit as mundane and domestic as anything the Cleavers ever exchanged, even if the subject matter isn’t. It’s endearing, and there is a high level of intimacy between them, even before Rick puts that pack of spearmint mints in her hands. We’ve been shipping for Richonne for a while. Fan service or not, it makes sense, these two. This may seem like a new Michonne, but she’s been heading this way for a long time. The first time she appeared, she was something out of a dream, or nightmare, standing in the woods, under that hood with the katana and those armless walkers. Then there was that scene in the prison when Beth hands Michonne Judith, when you realize that Michonne had — and lost — her own child, that she’s not something out of a dream, but simply a mother who’s somehow survived this plague on humanity. It’s an incredibly powerful scene, and it perfectly illustrates what this show is at its best, a tale about completely ordinary people undergoing an unimaginable catastrophe. Now, in a way, she’s back where she was before all this started. These are two people who have suddenly realized — pretty much at exactly the same time, on that couch — what they already had together and who they already were to each other. This isn’t a one-night stand. And what they have was already there, before they even kissed.